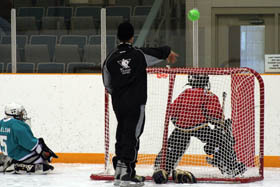 Calgary Goalie Camps from Torjager Hockey - Top Notch Goalie Instruction! These camps are open to goaltenders of all ages and skill levels. 10 hours of on-ice instruction! Goalie to instruction ratio 5:1. Students will be grouped according to age and skill level. 10 hours of on-ice instruction. 5 hours of off-ice training; stretching, agility and hand eye reaction. The off-ice training program will focus on developing each goalie's speed, flexibility, strength, endurance, balance, agility and coordination.